In brief: We’re spoilt for choice when it comes to picking a PC case these days, but if you want something that offers both excellent performance and great looks, check out this Fallout-themed chassis from NZXT: the H700 Nuka-Cola. The case is the latest in NZXT’s gaming-centric CRFT line that debuted last month with the PlayerUnknown’s Battlegrounds-inspired H700 PUBG. It’s been created through an official licensing agreement with Bethesda and features a paint job based on the Nuka-Cola drink from the Fallout games. In addition to the Nuka-Cola name, fishbowl helmet-wearing model, and red color scheme, the case appears to be battered and peeling—making it look like it survived an apocalypse. There are also some extra touches that bring it closer to Fallout’s world, including a custom I/O port with a circular air vent, along with some red LEDs. Underneath all the Fallout-themed paint and mods lies an excellent mid-tower in the NZXT H700. The all-steel case boasts a tempered glass side panel with a quick-release feature and some great cable management—another element that has been customized for the H700 Nuka-Cola. "NZXT’s commitment to bringing some of the most elegant and high-quality products to gamers made us very excited to work with them," said Bethesda Softworks’ Director of Licensing, Michael Kochis. "The passion and care poured into this case is clear, and we hope fans are excited to bring home a piece of the Wasteland." 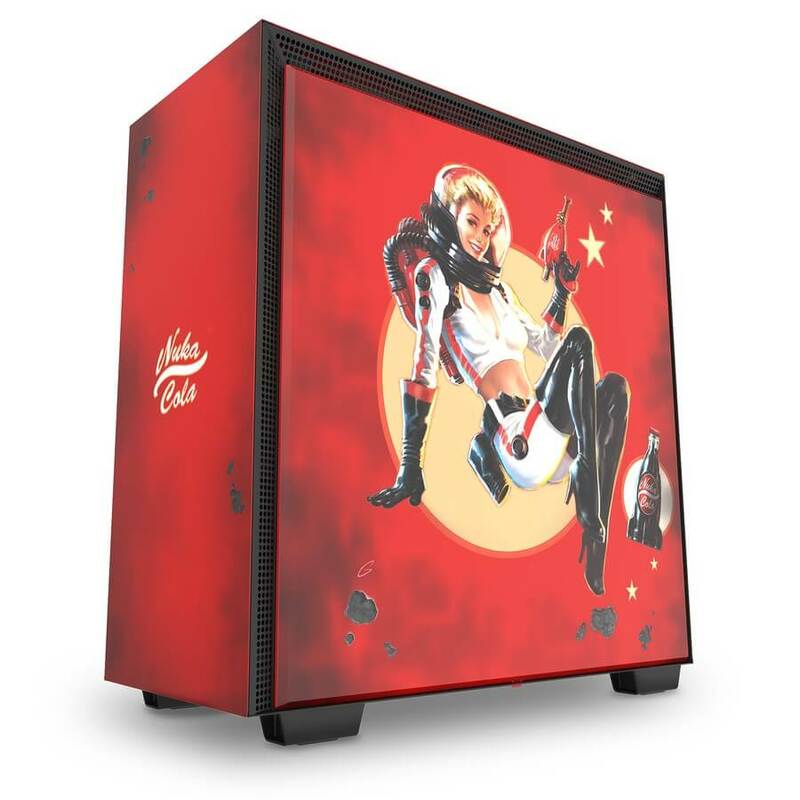 Only 2000 H700 Nuka-Cola cases have been made, which are available in the US now for $300—double the price of the standard H700. Buyers also get a Vault-Tech bobblehead figure with their purchase. For those who want even more Fallout-based customization, NZXT is offering an optional Nuka-Cola Cover (US launch soon) for its N7 Z370 motherboard for $50. Both case and cover will be available in other locations later this month.